Whether you looking to protect a small area in your home from allergens and environmental pollutants or just want to keep your office space contaminant free, Holmes offers a great selection of air purifiers that fit your specific need. What makes both of these desktop and mini tower design air cleaners a great choice is that they can fit practically anywhere inside a small space. You can place each device comfortably on a table, a desk or even out of the way on a shelf. So, keep reading below to find out how each type of air purifier compares. We’ll outline how each product is the same and different, with the goal of helping you decide which product is the best for your needs. Holmes produces two desktop air purifiers that are great at keep the air around you free and clear of airborne contaminants. However, these two products are so close in function and design that it can be hard to discover how each one is actually different. Fortunately, we’ll shine some light on this for you in the review below. 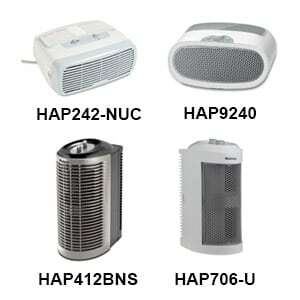 Note: The HAP242-NUC is featured on our budget air purifier page. Dual position design. This allows you to place it horizontally or vertically on any tabletop surface. Fortunately, the differences that you’ll find in these Holmes desktop air purifiers is so small that you may not have even noticed them unless they were pointed out to you. The HAP242-NUC uses an older style of slider controls to adjust the fan speed and to turn on the ionizer. The HAP9240 uses a rotary knob for the fan speed and push button for the ionizer. 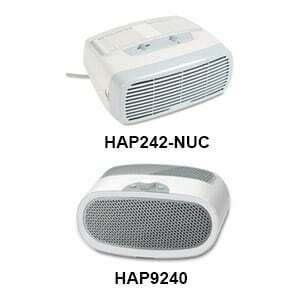 The HAP242-NUC is rated to purify a space up to 110 square feet, while the HAP9240 can only handle 100 square feet. This difference is negligible. Product Dimensions: HAP242-NUC measures 14.8 x 11.4 x 7.2 inches. This is about 2 inches wider and deeper than the HAP9240, which measures 13 x 9.5 x 6.2 in. The other popular type of air purifiers that Holmes produces for small areas and rooms come in a mini tower design. You’ll find that with the mini tower design air cleaners that they have an almost even mix of similarities and differences in features. The major differences between these two Holmes mini tower air purifiers are the main filter type that it comes bundled with and the maximum room coverage it can handle. 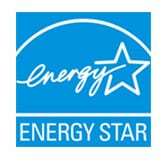 Comes with a HEPA-type filter, which removes 99% of airborne particles only as small as 2 microns. This doesn’t include the finer dust or allergens that cause breathing problems. However, it can be replaced with a Holmes AER1 True HEPA filter as mentioned below in the HAP706-U for an additional cost. Recommended for spaces up to 120 sq. ft.
Comes with a True HEPA filter that’s certified to remove 99.97% airborne particles as small as .3 microns. 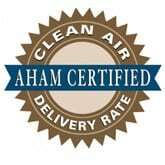 This includes the widest range of airborne allergens, dust, pollen, pet dander, etc. that harm your health. This is be best type of air purifying filter you can get. 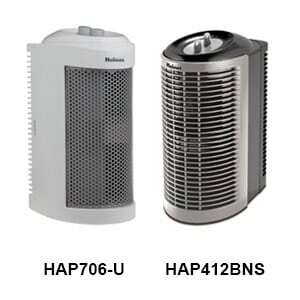 As you can see above, the HAP706-U is a far superior air purifier because it uses a top-of-the-line True HEPA filter and can purify a lot larger space. We highly recommend buying this unit over the HAP412BNS.